Winged Snail: Drinking: Beer - and a lot of it. Drinking: Beer - and a lot of it. 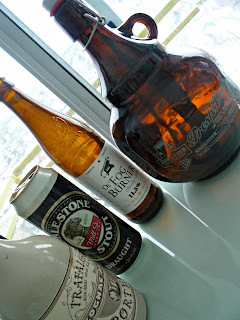 Growlers (2 red, 1 winter warmer), 2 Mill Street Cobblestone Stout in canes, Trafalgar Cognac Aged Porter, Garrison Ol' Fog Burner Barley Ale and a few other assorted beers. 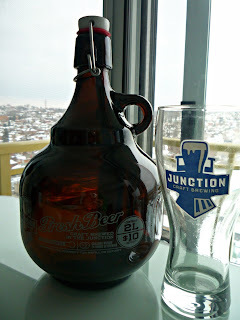 The Junction Craft Brewery is close walking distance to our place so we have been back more than a few times in recent days! Of course, this list doesn't include the many delicious pints we had at our favourite local establishments! Hello again @3030DundasWest! Skinny Dipping with Friends (by Sawdust City) - was a cinnamon loaded beer that made me dream of sugar plums! Black Coal Stout (by Railway City) has got to be the most aptly named Christmas beer on the market and a delicious one at that! Iron Spike's Honey Elixir is delicious and comes with some amazing advertising! We even purchased a Junction Craft class so that we can consume our delicious beer - poured from the cutest shaped growler I have ever seen - into a label appropriate vessel! We have been on a beer kick for months now. However, I keep coming back to Frog Pond Winery's amazing, mature ice wine - which I only had once, four years ago. How's that for a memory?